The Kangaroos will want to avoid the clean sweep by RSA and their red face. The results for Australians have been terrible this time around. 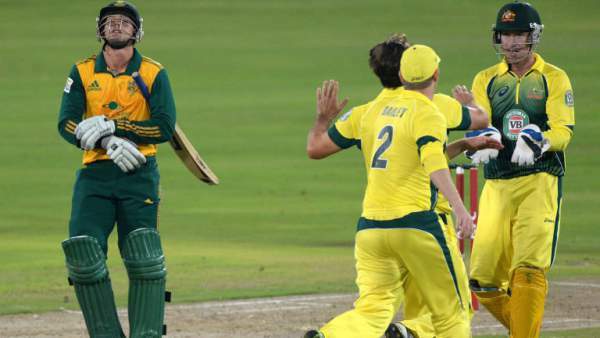 South African team defeated the visitors by six wickets in the last game played on October 9, Sunday. It was their fourth victory in the row. Kyle Abbott and Tabraiz Shamsi proved their worth by taking four and three wickets respectively. Thus, the hosts successfully restricted the visitors to a total of 167 runs. Thereafter, the captain Faf du Plessis made 69 run and ensured the win without any problem. Now, South Africa must be looking forward for a 5-0 whitewash. If this happens, this would be the first time in the Australia cricket history. SA will be out on the field with the same playing XI as they were on Sunday. Australia is having such a bad time in the ODI series and the loss in the fourth game added more to it. There were only two batsmen namely all rounder Mitchell Marsh and wicket-keeper Matthew Wade who made 50 and 52 runs respectively and showed some fighting spirit. Adding to the worse, the bowling department of the Aussies have failed miserably. RSA won by 31 runs. Probable 11: David Warner, Aaron Finch, Steve Smith (c), George Bailey, Travis Head, Mitchell Marsh, Matthew Wade (wk), John Hastings, Adam Zampa, Chris Tremain, Scott Boland. SA vs AUS 5th ODI is set to start at 1:30 pm local time (11:30 am GMT / 5 pm IST). India: TV – Ten 2, Ten 1 HD. Live streaming – Ten Sports Live. UK: TV – Sky Sports 5. Live streaming – Watch Sky Sports. USA: TV – Willow TV. Live streaming – Willow TV YouTube. Australia: TV – Fox Sports. Live streaming – Fox Sports Australia Live. Stay tuned for full video highlights, man of the match, etc.